The SmartphoneNow site also carried an interesting breakdown of major parts and their costs in the Nexus One (click on the graphic of the parts classification table in the lower left to see a full size version of the graphic). Like all "smartphones" these days, major components come from all around the world. 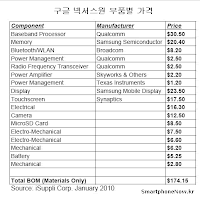 However, since Samsung Electronics contributes both the memory (at $20.40) and the mobile display (at $23.50), it ranks number one on this list in terms of the value of parts. Qualcomm comes in second with parts worth $35.50. So, if Nexus One does extremely well in Korea, taking market share away from Samsung Electronics own models, does that really hurt Samsung? The information presented here simply confirms that Korea's mobile market is in the early stages of a complete transformation (I was going to say "upheaval,") with consequences for everyone, handset manufacturers, companies that make handset components, mobile service providers, and of course customers. In a development that could really shake up Korea's market, Google is selling the phone directly over the internet via its own site, using a picture of the phone plus the headline and tagline "Nexus One -- Web Meets Phone." That pretty much says it all, it is all about mobile broadband, with the content and applications it makes possible. If you clicked on the previous link, you'll see the notice "Sorry the Nexus One Phone is Not Available in your Country." I wonder when it will be and which of Korea's mobile service providers will offer it. The rapidity with which customers in Korea express a preference for Android-based phones, before they even arrive in the Korean market, is indeed interesting. However, in one sense this is not at all surprising. Korean customers are "tech-savvy" and easily capable of discerning that all phones will very soon be hand-held computers. For Korea's mobile sector and its IT industry generally, the best strategy will be to open the marketplace up, not only for the Nexus One, but for all the new handsets, tablets and other devices that will emerge in the second decade of this century. Doing so may mean hardships in the short term for some companies, but they will strengthen Korea's case to be one of the world's most important testbeds for cutting edge new technology. Apple's iPhone and various Android models should do very well here this year!